De gedenkplaat in de Ieperse kathedraal. Vele Britten bezoeken de Ieperse kathedraal en gedenken de gesneuvelden. 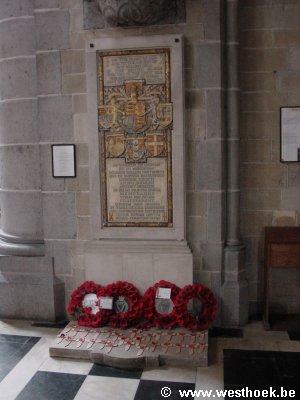 Inside the church, on the left-hand wall of the transept, stands a commemorative plaque to the Commonwealth soldiers who fell on Belgian soil. 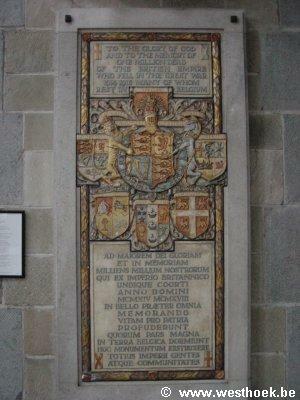 The plaque is marble, worked in relief. At the top is the text: "TO THE GLORY OF GOD AND TO THE MEMORY OF ONE MILLION DEAD OF THE BRITISH EMPIRE WHO FELL IN THE GREAT WAR 1914 1918 MANY OF WHOM REST IN BELGIUM". In the centre, a cross is formed by the following coats of arms: at the top “India”, in the centre a banner reading “The United Kingdom of Great Britain and Ireland”, with their coats of arms and mottos;ers ñ The 1914-18 to the left “Canada”; to the right “Australia”; underneath in the centre, “New Zealand”; to the left “South Africa”; to the right “Newfoundland”; all of which is surmounted by a banner reading “Dieu et mon Droit”. Below these coats of arms is the Latin text of the words inscribed in English on the top of the plaque : "AD MAJOREM DEI GLORIAM ET IN MEMORIAM MILLIENS MILLIUM NOSTRORUM QUI EX IMPERIO BRITANNICO UNDIQUE COORTI ANNO DOMINI MCMXIV MCMXVIII IN BELLO PRAETOR OMNIA MEMORANDO VITAM PRO PATRIA PROFUNDERUNT QUORUM PARS MAGNA IN TERRA BELGICA DORMIUNT HOC MONUMENTUM EXSTRUXERE TOTIUS IMPERII GENTES ATQUE COMMUNITATES"